Up for some museum-hopping while in Dublin? To help plan your trip, we have enlisted the advice of our travel experts to give us the low-down on the top galleries in the city. Get your fill of exhibitions at these galleries and museums. Visit the National Gallery of Ireland for Worldclass exhibitions, free admission to the permanent collections and even get creative by sketching in the Gallery. Make a good start to your New Year and visit the National Gallery for their annual January exhibition, featuring Joseph Mallord William Turner’s watercolour exhibition. Each year brings a rich experience and you are bound to discover something fresh and unique in his work each time. His approach this year showcases his care for watercolours, from the Victorian era to the present. On view you will find the wood cabinet commissioned by Henry Vaughan, made to store the works as well as a selection of silhouettes and miniature from the Mary A McNeil Bequest. The range on offer at The Hugh Lane extends from impressionists like Monet, Manet, and Degas to present-day artists. 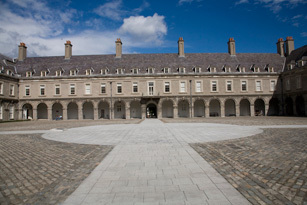 The gallery exhibits contemporary Irish as well as international artists. Triumphs by Richard Tuttle is a site-specific exhibition. 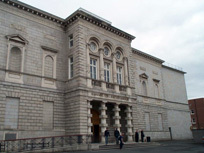 The exhibit seeks to respond to the local as encountered in the early Georgian architecture of the main gallery, Charlemont House (designed by Sir William Chambers in 1765) and to the Hugh Lane Collection (established in 1908). The installation is a Polysemous multipart construction, with focus on the Augustan era. The exhibition begins with work from the mid-1960s, continuing through to the present. William McKeown is recognized for his interest in humanity’s ongoing relationship with nature, outside and within. His artwork showcases his interest through paintings, drawings, watercolours as well as constructions/installations. This upcoming installation, The Golden Bough will focus on the chapter between Heaven and Earth. McKeown currently lives in Edinburgh but is originally from Tyrone in Northern Ireland. Here you will discover a wide variety of art in a dynamic program of exhibitions. The focus is on innovation and experimentation. The most extensive exhibition to date from the Museum’s own collection, The Moderns explores the development of modernity in Ireland through the visual arts from 1900 to 1975. The exhibition showcases paintings, sculptures, photography, film, architecture, literature, music and design from that period. Consisting of drawings, limited edition prints & multiples, photographs, watercolours and striking paintings and sculpture, the collection is sure to inspire avid art historians. The works all range across 20th century American art, most notably New York art of the 1960’s and 70’s. Notable artists include Marcel Duchamp, Jasper Johns, Robert Rauschenberg, Christo, Edward Hopper, Sonja Sekula, Sol Lewitt, Mel Bochner, George Segal, Hans Namuth, John Coplans, Diana Mitchener and a slew of others worth seeing. Download mTrip’s Dublin Travel Guide for more info on museums, monuments, galleries and more.